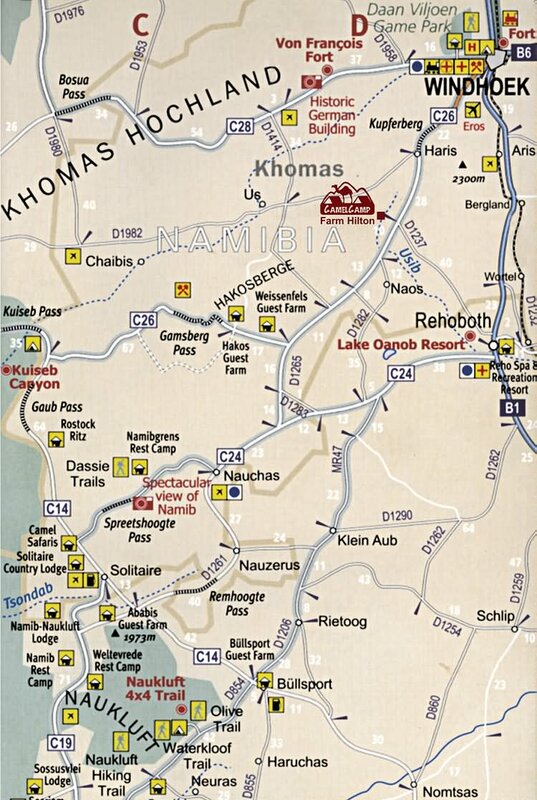 Directions to New Camel Camp: 70 km from Windhoek on road C26. Hikers say "You haven’t really been where you haven’t been on your own two feet"- and they are right, but Namibia is too vast and too hot to be explored on foot. 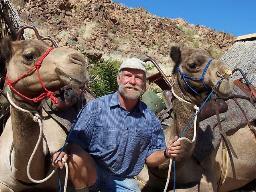 With our camels and Camel Camp owners offer a perfect alternative. You can experience our country and its world famous desert on a special holiday. 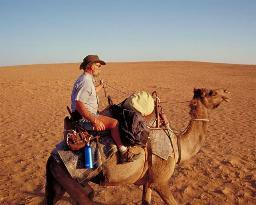 Hosts offer tours of one day or more, starting from Camel Camp and guided by Lumpi and his crew. It doesn’t matter for how many days you join the caravan - everything is brought along: food and drink, water and firewood, and tents, enough for several people for several days. You may wonder how you can carry guests and their luggage; don’t worry - the camels carry everything and you will be comfortable. All tours start and end at Camel Camp. Camel Camp is Lumpi's creation. It has been designed to be in harmony with the landscape while providing all the facilities you will need. There are little sleeping huts with comfortable beds and bedding. The ablution block has separate ladies' and gents' toilets and showers with hot and cold running water. You will have an unforgettable experience riding or walking alongside Lumpi's reliable camels in the vast unspoilt landscape. Lumpi is looking forward to welcoming you for a very special tour. Most important: sense of humour; love and respect for nature and the desert. For the sun: big hat; long sleeved shirts; scarf of light material to cover your neck and/or face; sunscreen; sunglasses. For the cold: warm fleece or sweater; warm trousers/track suit; woolly hat. For sleeping: isomat; sleeping bag torch; small pillow if required. For washing: towel and your usual washing things. For riding: 2 litre water bottle; long comfortable trousers; sensible shoes (not sandals); camera; binoculars; small backpack. Hosts will provide: top bag 100cm x 75cm for all luggage to be carried on the camel; bag for your isomat; fleece liner for your sleeping bag; protective cover to keep sand/moisture off while you are sleeping; mosquito tent. hosts serve all meals and drinks. You are welcome to bring your own snacks if you wish. Day ride: Ride starts at Hilton Farm House and will go along the river bed to the lunch camp, ending again at the farmhouse. 24 hour trail: Morning arrival at Hilton Farm and ready to depart at 11 on camels. Ride to overnight camp; light lunch.